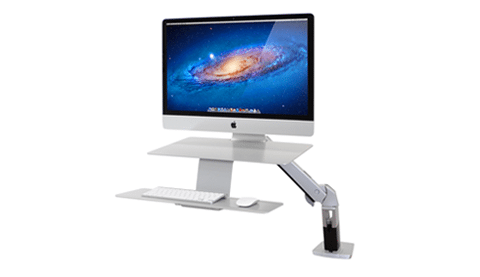 Monitor stands, arms and mounts are easy to install onto your office desk and provide a simple, uncluttered way of viewing your monitor screen. 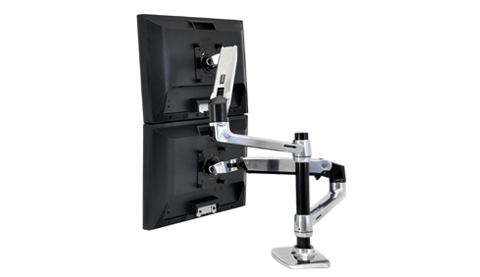 All monitor arms are adjustable, enabling the user to position their screen at the correct height in order to minimise neck and eye strain. The most popular cable management solutions are cable baskets, cable spines, port holes and grommets. These options are affordable, practical and aesthetically pleasing. Our range of cable trays and vertical cable management solutions come in white, silver, graphite and black, and are therefore suitable for all office environments. Having power modules integrated into your work surface will mean that less cables are running along your floor. 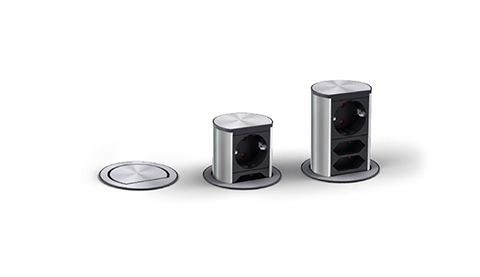 Integrated power sockets can come in multiple configurations, suitable for all office needs. Power modules are also useful for bench desking as it means many employees can have access to power outlets without having to use extension leads. CPU Holders can be adjusted to the underside of your desk and are perfect for keeping your floor space clear. This way, everything is kept off the floor which makes it easy to clean. CPU Holders also help to keep your CPU cool in order to prevent overheating. 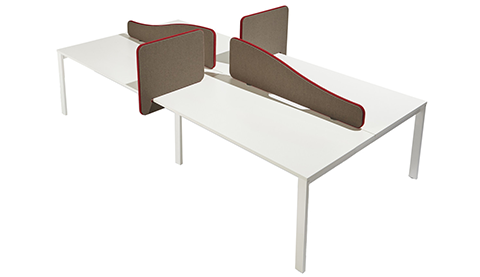 Desk-Mounted Screens are a great way to divide desks, especially when they’re situated in pods. They help to offer some privacy without separating your employees entirely. Opt for desk screens with tool rails to fit monitor arms to them. Most of our desk screens also have acoustic properties, helping to reduce the amount of noise traveling around your office. Instead of purchasing a whole new desk with height-adjustable properties, Sit-Stand Desk Mounts are the perfect alternative. Easily placed onto your existing worktop, these desk mounts allow you to alternate from sitting to standing throughout your day, which helps to improve your posture and health. Accessories are an important addition to any office space as they can help to keep your desk tidy and organised. Every office desk needs good accessories in order to increase productivity levels. 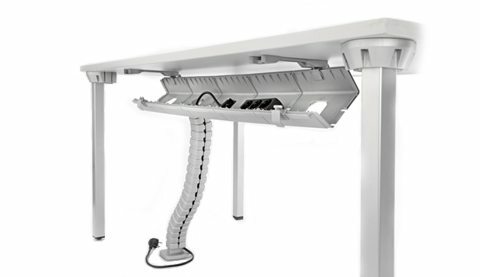 We have a range of cable management systems, which can be fitted to your desk to prevent unsightly cables from dangling down and potentially posing a health and safety hazard. Cable management is also beneficial as it can prolong your cables’ lifespan by ensuring airflow paths are kept unoccupied. 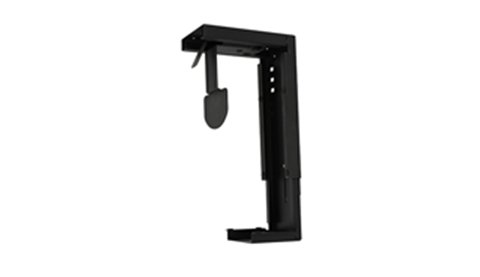 Included in our range of office accessories is monitor arms, cable management solutions, power modules, CPU holders, desk-mounted screens and sit-stand desk mounts. Each hold their own unique advantages, but work can benefit you even more when used together. The use of desk-mounted screens can offer your employees some privacy while they work. Some of our screens hold acoustic properties, and therefore help to reduce sound from traveling around the room. It has been proven that a neat and organised desk can increase productivity amongst your staff. Having a tidy office also offers great first impressions to potential clients. 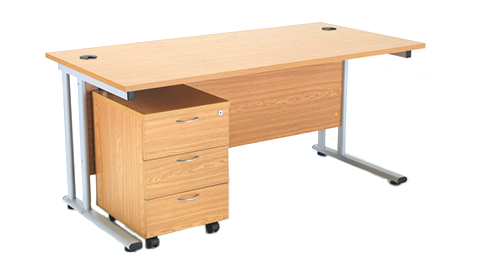 We offer a vast range of accessories that are suitable for all office environments and layouts. If you’d like to find out more about our accessories for office desks, browse our selection online or get in touch with a member of our sales team today. If you’d like to find out more about our range of Accessories or discuss your requirements, simply request a callback.